Welcome to the Heritage Vet Clinic Blog Page. Find information on medical and surgical conditions your pet may face in the course of their life. Find out about products that will help your pet be healthy. And get any news that may be helpful in taking care of your fur or feathered love ones. 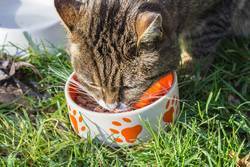 Is your cat losing weight but is hungry and wants to eat all the time? Your cat may have hyperthyroidism. Learn more about hyperthyroidism in cats, what causes hyperthyroidism and how hyperthyroidism is treated.